Photo submitted to Times Observer Touch of Tranquility Day Spa & Salon recently donated its Christmas basket raffle proceeds to Hospice of Warren County, earmarked solely for the John & Orpha Blair Hospice Residence. 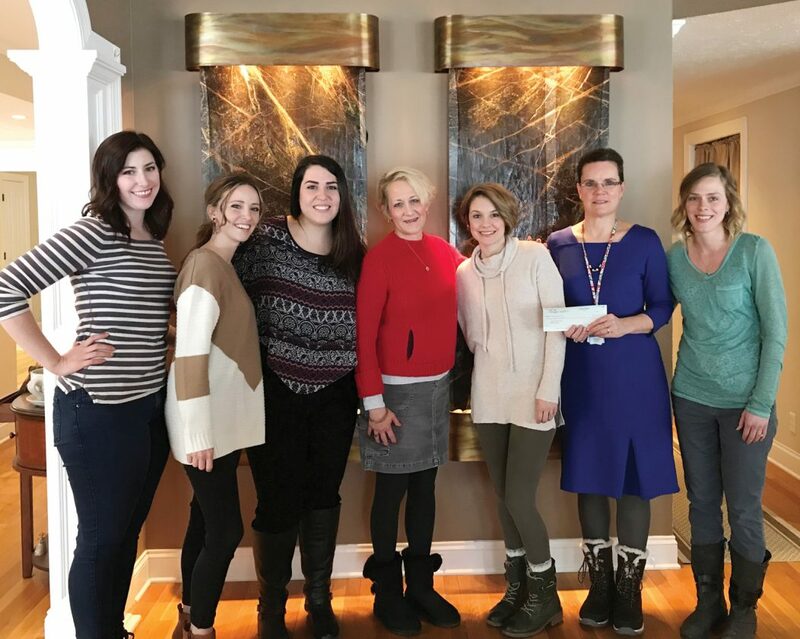 Lisa To, Executive Director, HOWC, and Barbi Zingone, Volunteer Coordinator, HOWC, met the Tranquility owners and staff, and graciously accepted the donation. From left are Taylor Ellsworth, Brook Miller, Seneca Ogens, Zingone of Hospice of Warren County, Alicia Jones, To of Hospice of Warren County, and Tammy Kibbey. The Warren Area High School Class of 1966 will have lunch at noon Saturday, Feb. 16, at the Forester. Respond on Facebook, or call 723-7538. The Community Foundation of Warren County’s scholarship application will soon be available for the 2019-2020 academic year. To receive a reminder, go to cfowc.org, click on “Receive,” then on “Apply for Scholarships,” and enter your name and email address. The Community Foundation will notify you when you may access the application. The PA Route 6 Alliance wants to recognize six innovators, movers, and initiatives along the Heritage Corridor that made a difference in 2018 and is now taking nominations for the “Do 6” Awards to be presented at the Annual Meeting in May. The awards are presented to individuals, businesses or organizations that have undertaken outstanding efforts that give new meaning to “DO 6” by supporting and implementing sustainable tourism development along the PA Route 6 Heritage Corridor. The award winners exemplify the mission of the PA Route 6 Alliance to protect, preserve and promote the scenic, cultural, historical and recreational resources in the northern tier. The awards are presented in the areas of Heritage Partnerships, Leadership, Heritage Community of the Year, Heritage Tourism (projects or events), Artisan of the Year and Lifetime Achievement. Last year’s award winners included the Bradford County Veterans Memorial Park, Towanda (Heritage Partnership Award); Venango General Store, Venango (Heritage Tourism Award); Dan Glotz, Warren County Planner (Heritage Leadership Award); White Mills, Wayne County (Heritage Community of the Year Award); Curt Weinhold, Photographer, Coudersport, Potter County (Artisan of the Year Award); and Senator Joe Scarnati, PA Senatorial District 25 and Senate President Pro Tempore (Lifetime Achievement Award). Nominations can be submitted by anyone along the PA Route 6 Corridor and are due by Friday, March 8th, 2019. Nomination forms and category descriptions are available on the paroute6.com website at http://www.paroute6.com/annual-awards-program. Winners will be notified prior to the meeting. For more information, contact the PA Route 6 Alliance at (814) 435-7706. The Allegheny Chapter of the Ruffed Grouse Society announces “Habitat Days,” in which any hunter or bird watcher that wants to give back to the resource can help for two to three hours on Saturday, Feb. 9, or Sunday, Feb. 10, pruning apple trees. All you have to do is email wlhab@windstream.net if either of the two dates in this news release meshes with your schedule. The Habitat Days will start at noon at the green gate to the compressor station on Rt. 146 just east of Bloomster Hollow Road east of Clermont, McKean County. Water and hot sweet fern tea will be provided.